Let me get this straight – an overpriced control surface is what’s gonna change DJing? 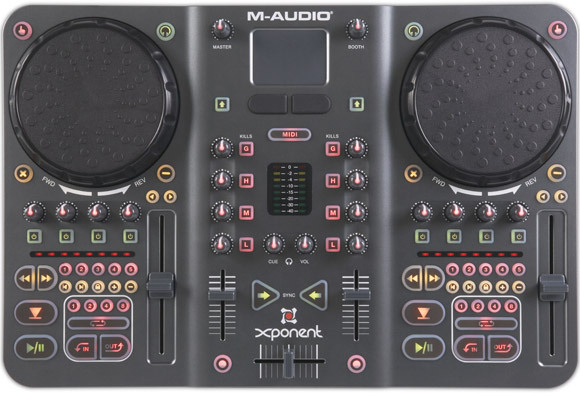 M-Audio announced their Xponent control surface/USB audio interface today, and this long-time DJ is distinctly underwhelmed. You know, when all there was to the SynchroScience line was the Torq software, the Conectiv and the X-Session Pro, I had this idea that they were building this mini-galaxy of interoperable DJ gear that one could purchase bit by bit and eventually put together a nice, integrated digital DJ system with all the bells and whistles. However, the emergence of the Xponent today turns out to be a bit of a head scratcher. First of all, where are the inputs? It’s got 2 sets of RCA outputs, but no inputs. This thing neither encompasses the functionality of the Conectiv nor does it look like it really works with it. Sure, if I’m a Mac user I can create an aggregate audio device with the Xponent and the Conectiv, but given that Windows users CAN’T do this, I get a pretty strong feeling that this thing is not designed to work alongside the Conectiv. OK, so let’s judge it on it’s own. MSRP $750 for a USB 1.1 audio interface and MIDI control surface made of plastic? It’s colorful, I’ll give it that – but it doesn’t even have 1/4″ jacks on it. Where’s the mic input? This thing is designed strictly for the person who wants to DJ with their computer and the Xponent and THAT’S IT. You know, maybe I’m wrong. Maybe it’s designed to be the replacement for one’s DJ CD players for the DJ who DOESN’T want to DJ mp3s on their turntables, in which case, that DJ is a luddite and probably not going to be attracted to something like this. OK, so maybe it’s a nice control surface for people who want to DJ with Ableton Live. Still though, I wonder if those people don’t already have an audio interface for their laptop, in which case, why would they want to spend $675-700 street on this when they could get the much slicker-looking Vestax VCI-100 control surface for $499? I just don’t understand. I think M-Audio has missed a real opportunity here by not making this something that either works with or includes the functionality of the Conectiv. However, one thing I do understand is this — any manufacturer out there who promises that they’re going to “change DJing” has a shiny new piece of plastic to sell, and that’s about it.